ive been looking at kienan lafferty tutorials for the past few days and they have helped me a lot with guiding me as to where to go to improve my art. in this specific video he talks about drawing bodies and constructing them. he also shows different stages in which you would ideally progress and work towards. what was shown on the left. i can tell the proportions are very wrong. and i can tell theres probably a bunch of mistakes with perspective in my drawing but im not exactly sure what i could practice and improve on to make it look better. i can draw a cube or cylinder okay on its own but once i start trying to piece them together to create a more complex object everything falls apart. i noticed i have extreme difficulty drawing forms connecting together? but i have no idea how id go about practicing that. would it be better to draw cubes and cylinders on their own again? should i use 3D models or objects during this as references or are cubes and cylinders easy enough to where i wouldnt need to open something like a 3D model to look at all the time. im really stuck in a rutt and any help or advice would be absolutely appreciated. 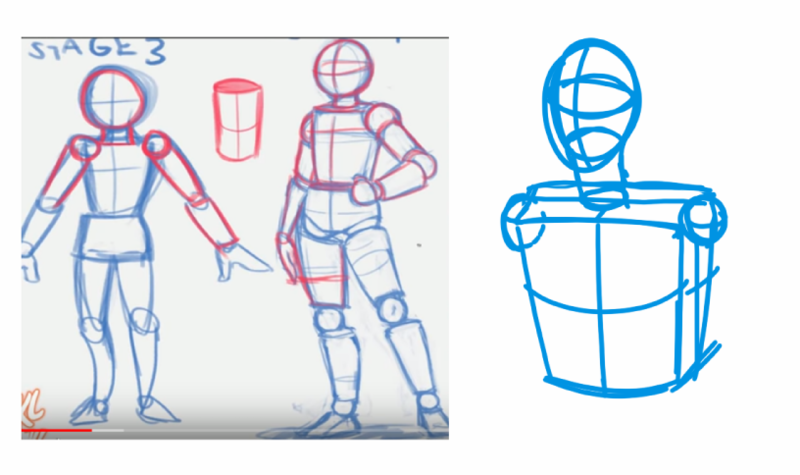 I actually think what you have right now is perfectly reasonable, it's just not exactly the forms and proportions he used, which doesn't really matter if the point for you is to draw a 3 dimensional manikin. If you want to get the proportions the same you just have to study his exact proportions. Take one of the forms and use it as an arbitrary unit of measurement to break down his manikin. If you want to get the perspective right, study the rules of linear perspective, and consider things like where you want your horizon to be next time. Just try everything honestly. Drawing is as much a mind game(if not more so)as it is a tactile game, you never know what is going to make something click in your head, and trying lots of things might reveal to you a problem you hadn't considered before. As long as you're actively thinking about the problem while you practice, you should improve(you'll always have plateau periods though).